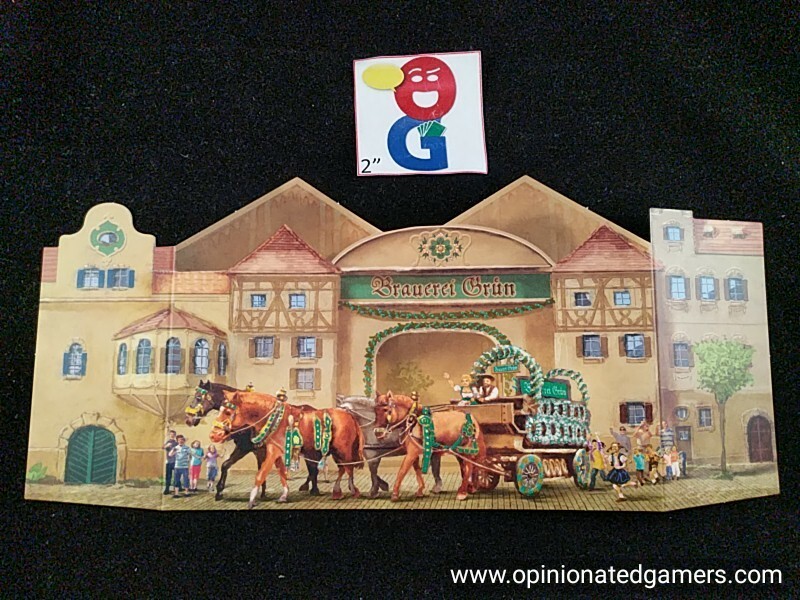 Like many of the recent RGG releases, I had not heard much about Oktoberfest until I saw it in the stores (or at Origins). I regularly travel to Germany, and despite having been to Bavaria on multiple occasions, I have yet to make it there in September in order to participate in Oktoberfest – the annual festival which started with the 1810 wedding celebration of Crown Prince Ludwig I and Princess Therese of Saxe-Hildburghausen. I was attracted to the game in part because of the theme – but also because of the designer. 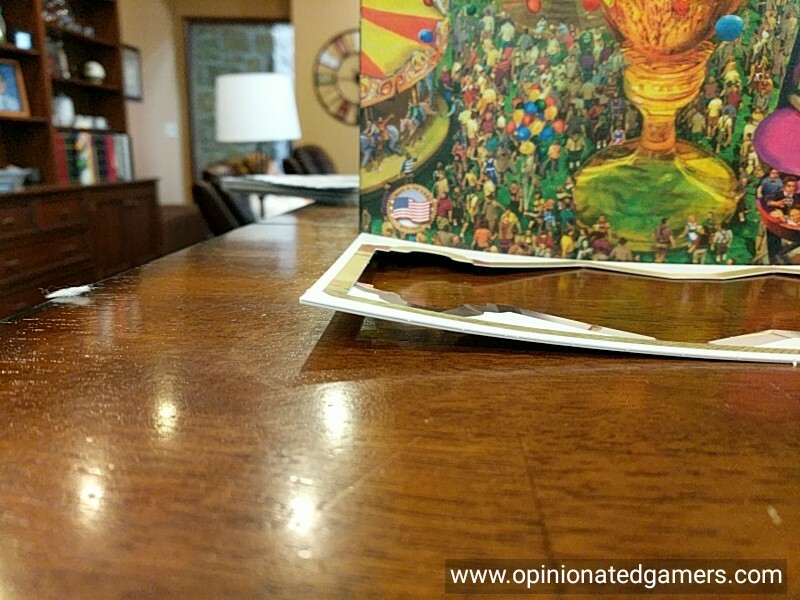 Joshua Balvin does not yet have many games under his belt, but I did find Fool’s Gold (his most recent previous design) to be a solid effort, and I wanted to see what else he had up his sleeve. 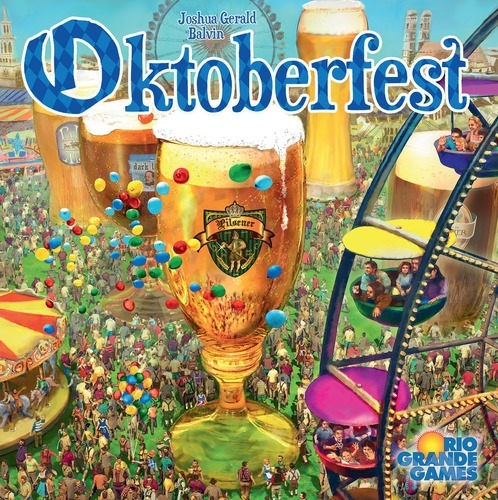 In this game, players take on the role of brewmasters, fighting to supply the Oktoberfest with the most consumed types of beer over the course of a single day. There are three phases (morning, afternoon, and evening) to that day. To start, the board is set up – each player gets a screen, and behind this places his starting money, patron tokens and single-barrel cards. The beer supply deck is set up with a 3×3 grid of starting cards laid out near the top of the board and then the three “Tapped-out” cards being shuffled into the remaining deck to serve as a supply. One tent on the gameboard is blocked off (after all, not everyone wants to drink for breakfast!). Finally, each player is dealt two double-barrel cards, each of these has a different beer variety shown on it. Make sure that you have two different types of beer. Again, the game is played over three phases (morning, afternoon, evening). They are similar in nature, though the composition of the beer card deck grows larger with each succeeding phase as well as the beer tent availability. Each phase has a number of player turns, and in each turn, the active player always has the choice to do one of three possible actions: 1) Auction cards, 2) sell one barrel, 3) close a tent. AUCTION CARDS – The full supply deck is made up of 49 cards, there are 6 suits of beer types (and one wild suit), and each suit has numbered cards from 1-7. In the first phase of the game, you only use cards 1-4. The 5 and 6 ranks are added in the afternoon, and the 7 rank is added in the evening phase. At the top of the board, there are three columns, each with three stacked cards. The player wishing to auction placed the marker next to one of the columns. That entire column of cards is now up for auction. Players bid by placing coins (their bid) in front of their screens – starting with the player left of the active player and going once around – successive bids must be higher than the previous bid. When the bidding gets back to the auctioneer, he must either accept the highest bid and allow the highest bidder to play the cards OR he must pay the highest bidder his bid amount PLUS one coin to play the cards himself. In the rare case where no one else bids, the auctioneer can play the cards for free. Whichever player won the cards then takes them and discards one. The remaining two cards are placed on the board. They must be placed in different tents; placed on top of any existing cards – but the newly placed card must be of higher value than the previously laid card. The current value of that stack will be equal to the sum of all the cards in that stack, but will only have the type of the top-most card. If a wild card is played, you take one of the six beer type tokens to place on that card to show what type it is. 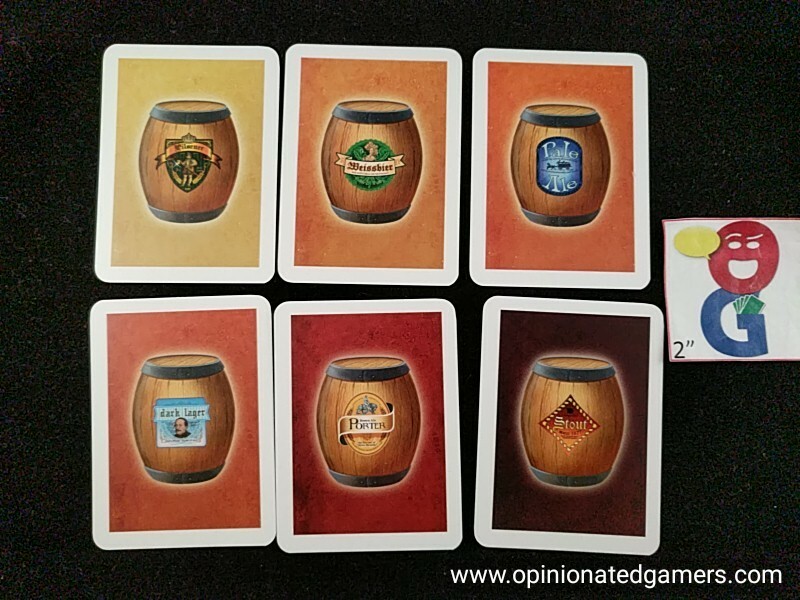 Then players must supply barrels for each of the two cards played. The card shows how many barrels you may choose to supply – between 1 and 4. You must pay 1/3/5/7 coins for 1/2/3/4 barrel cards taken. The money is placed above the supply deck of that type of beer and the player takes the cards and puts them behind his screen. Each beer only has ten barrel cards for the game. You may choose to not buy any barrels for your played cards, but you MUST play two cards in this phase. Finally, the player refills the gate by drawing three new cards. Then, the player must check all the gates to make sure that two cards in each gate can still be legally played (based on the ascending number rule) – if not, place a “closed gate” marker on that gate. If the second tapped-out card is drawn, play is temporarily stopped for a second for a special phase. 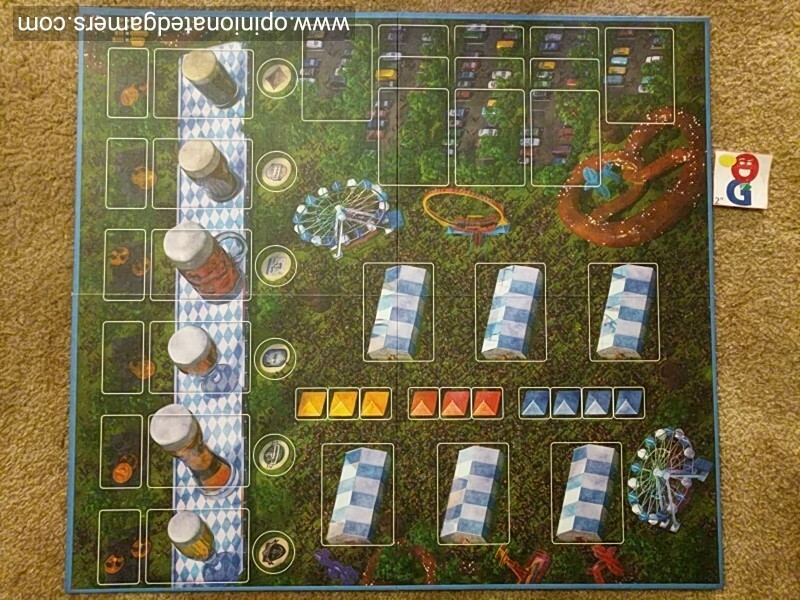 When Oktoberfest is tapped-out, the tent with the highest numbered supply card has all of its cards discarded. If there is a tie for highest number on top, the stack with the highest total sum is discarded. The tapped-out cards are left aside, but all other cards in the discard pile are shuffled with the remaining draw pile to make a new draw pile. Continue to supply the gate until three cards are in it. The third tapped out card has no effect if it is drawn; this special phase is only trigged when the second card is seen. SELL ONE BARREL – when you sell a single barrel, you turn a single barrel card back into the supply (these are the cards that you bought after placing a card in an auction action). You can either take ALL the money above the type of beer card returned OR half rounded up from any of the other beer varieties. CLOSE A TENT – when a player chooses to close a tent, he first takes all the patron tokens from the first available space on the patron track on the board. He adds this to his total behind his screen. Then, an auction begins to decide which tent is closed. Starting with the player to the left of the active player, players go once around the table and can place any number of patron tokens on a single tent – this stack is marked with a player marker to denote ownership. Any number of players can play tokens to a single tent, but each player may only play to a single tent. When placing tokens, no tent may ever have the same number of tokens as any other tent. It is possible to pass on your turn to place tokens. Once all players have had a chance to play once, the tent with the most tokens is closed. The value of the tent is then determined; the sum of all the beer cards is calculated and the type is equal to the beer type on top. Then, all players reveal the number of barrel cards they have of that type. The player (and all ties) with the most barrels take VP tokens equal to the full value. Second place in barrels gets one-half of the value. In a 4 or 5 player game, you will also score for third place – receiving half the value of the second place player. The cards in this tent are flipped over, mostly as a reminder to not play any more cards to this tent in this round. Finally, you must re-distribute the patron tokens. First, all players who bid on any tent other than the one that closed get their tokens back. Then, all the tokens placed on the tent that closed are equally distributed amongst the players who did not bid on that closed tent. If they cannot be split up equally, the remainder are placed one at a time on any spaces on the patron track which still have patrons on them. The patron track has 3 yellow spaces (for morning), 3 red spaces (for afternoon) and 4 blue spaces for evening. If you move into a new color of tent, you must prepare for the next phase. Otherwise, play simply moves to the next player. When the phase changes, you need to reset the board a bit. All the cards from previously closed tents are discarded from the game. All closed gate markers are removed. The new cards (5+6 for afternoon and 7 for evening) are added to the discard pile. Then all the cards (discard/draw/in the gates) are shuffled together with any set-aside tapped out cards to form a new draw pile. The gates are replenished. Any tapped out cards that show up in this re-supply are reshuffled into the draw deck. Also make sure that any blocked tent markers are removed so that all six tents are available. The game ends after the tenth tent is closed; i.e. the final space on the patron track is used. At this point, the player with the most VPs is the winner – again, remember that the only way to score VP tokens is to gain them though the closing of the tents. If there is a tie for VPs, ties go to the player with the highest remaining total of coins and patron tokens. 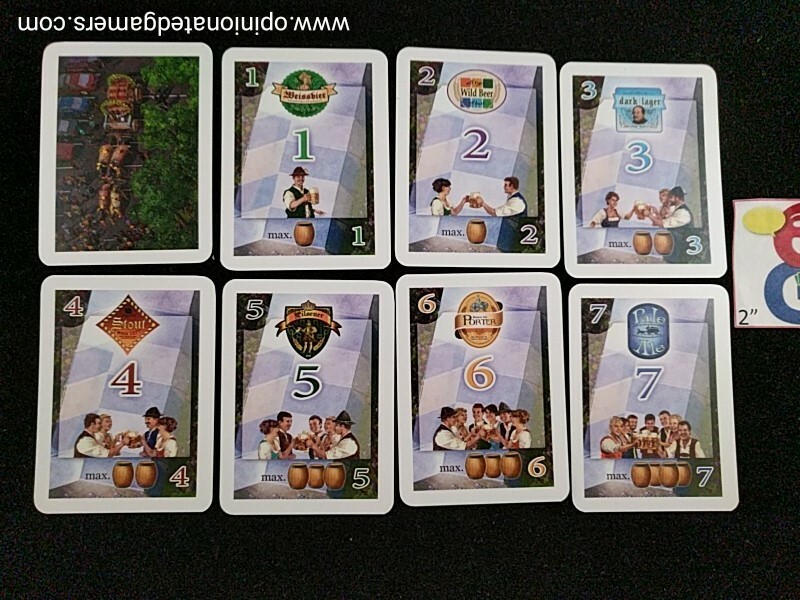 Oktoberfest is a surprisingly complex game. When I first read the title, I wasn’t sure what to expect. I was half-afraid that this would be a game about the actual brewing of beer – because though I am highly interested in games with that theme, I have yet to really find a game which has been good with that beer-making theme. This game is really a stock game, and one that involves more than just buying the most stock. The trick here is in the manipulation of the payouts. There will only be ten payouts in the game (At the closing of a tent), so you don’t have many chances to gain VPs. Since each tent closure involves an auction which all players can participate in, you’ll likely have to cajole/persuade/trick your opponents into working with you to get the desired tent to close. Or, if you’re particularly sneaky, you can manipulate the game to cause very low payouts with mostly empty stacks to shorten the game length. Like many stock games, this one can be hard to grasp at first. There are a couple of different mechanisms in play here, and it can be tough to see how they mesh together in your first game or two. In the end, to score VPs, you have to have the most shares (barrel cards) in a particular type, and get tents serving that type of beer to close. But… this requires you to also have patron tokens to place on those tents AND you have to win auctions with the right cards so that you can play them on top of piles. (Sure, you can also hope that your opponents play the right cards, but you need to play cards to buy “shares” in that type of beer, so you really need to play some of that type of cards yourself). The game works hard to keep any player from being able to dominate play because the two currencies in the game (coins and patron tokens) are mostly closed. There are no other coins to be added to the system after the setup. Sure, any player can sell a barrel to reclaim coins – but usually the player after a large purchase tries to swoop in to collect a large number of coins (or at least half of them). There are patron tokens to be added with each successive closed tent (one per tent), but all of the successfully spent tokens are recycled amongst those who did not succeed. Thus, if you helped get a particular tent closed earlier, you’re likely not in a position to strongly influence the next tent auction. So, as the resources tend to recycle amongst the players, the game comes down to timing – you need to figure out when to “steal” an auction if you need particular cards (which then help you control play as well as buy stocks) and when to try to get a tent to close. I like to be ready to win an auction when it’s not my turn so that I can use my action choice to then either try to get more coins or put a tent up for auction. The other way to get good income is to offer up a set of cards that you know is particularly juicy for multiple opponents – getting them to bid against each other usually leads to a good coin payout. The pacing of the game is nice and quick for the most part – the game ends after ten tent auctions – and while it’s possible for the players to run though the entire beer card deck, it’s more likely that circumstances will cause tent auctions to be held. The uncertainty of the end of each round, as well as the uncertainty introduced with the “tapped-out” mechanism, helps to build a sense of tension throughout the game. In my early plays, I’ve definitely felt the struggle of wanting to do multiple things on a turn but only being able to make one choice. The artwork is functional and passable. The board itself is a little cluttered with the background art, but once you populate the board with cards/tokens and get used to the game, it’s not that bad. The cards themselves are simple in format with a large number in the center and the suit (beer type) at the top. The cards all have the same background, but the different colored numbers for each suit keep things from getting confused. The share cards are all different beer shades of yellow/brown, but they are pretty close to each other. I wish that these cards would have had some sort of corner/top indexing as the shades are close enough to be mistakenly placed in the wrong place. 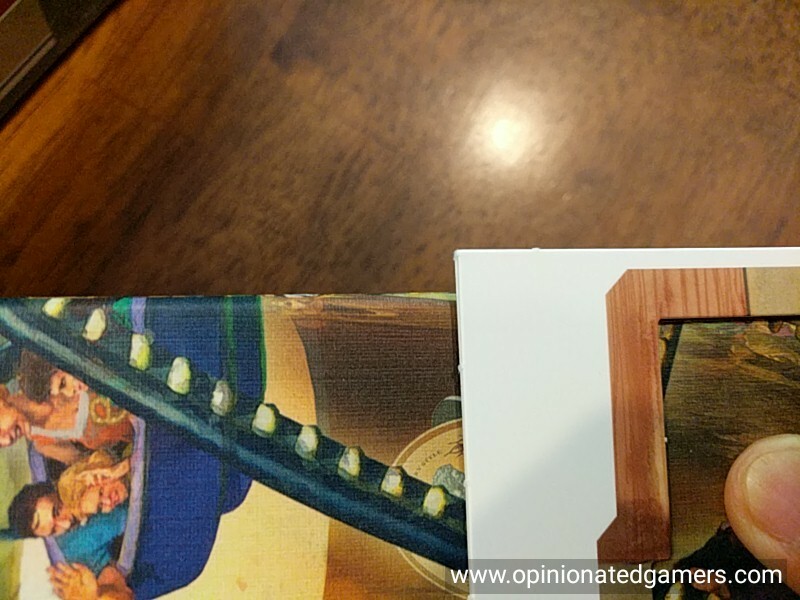 I’ll admit that I didn’t think that this game would have been a stock game, but it’s a very solid entry in the genre, and one that I still have plenty of room to explore after two games – it’s a very tricky thing getting the right beers to payout when you want them to payout! While the title and the theme make me want to drink a beer or four while playing the game, there is so much going on that I don’t think I could afford to reduce my playing acumen with the effects of alcohol. Those drinks will have to wait for afterwards! This entry was posted in First Impressions. Bookmark the permalink. I’m still waiting for a great beer-making game as well. Any recommendations?